A visit to Trump’s immigration bedlam. LAREDO, Texas – In one of his first executive orders a year ago, President Trump commanded that immigration judges from across the country should be rushed to detention centers along the border, warning that an uncontrolled migrant influx was threatening the national security. This story was produced in collaboration with This American Life. Listen to the story. Trump said that everyone caught crossing the border without papers should be detained, including women and children and people seeking asylum. The judges were dispatched to speed up immigration court decisions on those cases and facilitate swift deportations, to reinforce the president’s message that he was making the border impenetrable. And so in this gateway city on the Rio Grande, inside a building rimmed with barbed wire, past security guards and locked doors, immigration judges on short details started hearing cases in a cramped courtroom that was hastily arranged in March. But seven months later, the case of Oscar Arnulfo Ramírez, an immigrant from El Salvador, was not going quickly. He was sitting in detention, waiting for a hearing on his asylum claim. And waiting some more. The court files, his lawyer discovered, showed that Ramírez’s case had been completed and closed two months earlier. Since the case was closed, the court clerk couldn’t schedule a new hearing to get it moving again. In fact, the clerk didn’t even have a record that he was still detained. Ramírez’s case was one of many signs of disarray in the improvised court in Laredo, which emerged during a weeklong visit in late October by a reporter from The Marshall Project and a radio producer from This American Life. Instead of the efficiency the Trump administration sought, the proceedings were often chaotic. Hearing schedules were erratic, case files went missing. Judges were exasperated by confusion and delays. Like Ramírez, detainees were lost in the system for months on end. For a view of the border crossing in Laredo and the grinding process migrants begin there, check out Kirsten Luce's photos from the gateway on the Rio Grande. With the intense pressure on the court to finish cases, immigrants who had run from frightening threats in their home countries were deported without having a chance to tell the stories that might have persuaded a judge to let them stay. In all, from March through December more than 100 immigration judges were sent for one- or two-week details to at least eight detention facilities near the border, in what administration officials called “the surge.” Many judges volunteered, responding to the president’s call. In several courts, especially at the beginning, there were few cases, and the judges had little to do. In others judges were swamped. Problems of disorganization were widespread — but the court in Laredo stood out. The administration expected the judges would hasten deportations of illegal border crossers and also help reduce the huge backlogs in the immigration courts – at last count more than 650,000 cases nationwide. A year later it’s unclear whether the surge produced significant progress towards either goal. The immigration courts operate differently from criminal courts. In civil proceedings, they determine whether immigrants will stay legally in the country or have to leave. They fall under the Justice Department, in the executive branch, so the president and the attorney general have considerable leeway to tell them what to do. Before the surge, hearings for immigrants in three detention centers around Laredo had been conducted by judges sitting in a longstanding court in San Antonio, who were beamed in by video conference. Trump administration officials wanted a faster pace. A courtroom for a judge was set up in a narrow, windowless room inside one detention center, which is run by a private prison company, CoreCivic. The judge and the immigrants sit barely a few feet apart. Officials at the Executive Office for Immigration Review, the Justice Department agency that runs the immigration courts, were alarmed when they first saw the courtroom, insisting that it was too small to be safe for the judges and clerks. The agency “cannot and will not place its staff in a location where their safety is not protected to the highest extent possible,” a justice official wrote in an email on Feb. 24. But to meet the demands of Trump’s order, the court officials agreed to use the room as long as a security guard was posted next to the judge. There were other ways the court in Laredo was different from regular courts. Although immigration courts are generally open to the public, visitors here had to pass the scrutiny of CoreCivic security guards sitting behind a thick window. A guard on duty explained that no one could enter without clearance from Immigration and Customs Enforcement, or ICE, the agency in charge of detaining immigrants that also serves as the prosecutor in immigration court. In a constantly spinning sequence of rotations, each judge was coming for a two-week stint, with no overlap between one and the next. Since it’s rare for a case to be completed in two weeks, judges were left to decipher notes about decisions by judges who came before. The clerks also came for two weeks, but not necessarily with the judges. Often judges and clerks were coming from different parts of the country, learning each other’s quirks for the first time. Two ICE prosecutors came for four-week details. Spanish interpreters, essential in a court where most immigrants are from Latin America and speak no English, also came for short-term tours. The immigration courts, long relegated by the federal government to technological neglect, still operate with paper files. The case files, the basis of the court’s work, stayed in San Antonio, 150 miles to the north. A clerk in San Antonio was responsible for shipping files down the highway to Laredo in time for hearings. Often they didn’t arrive in time—or at all. As a result, judges faced serial frustrations. One morning in October, the court was scheduled to begin with a hearing for an immigrant whose identity number included the digits 991. But that immigrant was not in court. The ICE prosecutor’s files showed the case was closed. The clerk’s records indicated the immigrant had probably already been deported. There was, however, a detainee whose number included 919. But Judge Barry Pettinato, in the second week of a two-week detail in Laredo, did not have 919 on his schedule. Pettinato had come from Charlotte, N.C., an orderly court where he has a record as a capable, experienced and tough judge. After the days he’d already spent in Laredo, he gave a resigned laugh recognizing that his efforts to move things along that day had been already been foiled by a typo. Another hearing was for a Honduran immigrant who was asking the judge to release her on bond. But Pettinato had no documents for her bond request. Her lawyer, Roel Alanis, assured the judge he had filed all the papers in San Antonio ten days earlier. “That could explain it,” the judge said, rolling his eyes, suggesting that such delays were familiar. Without the documents the hearing could not proceed, so the immigrant would remain in detention and Alanis would have to return two weeks later from his office in Weslaco, three hours down the highway. A third hearing could not go forward because the judge couldn’t reach the lawyer, Jerome White, on the telephone. An assistant in White’s office said afterwards that she was repeatedly dialing the court’s number, but no one was able to put her through to the judge. Although Pettinato was trying to keep a brisk pace, by the end of the morning he still had a stack of case files unopened. In a pointed aside to his clerk, the judge said there was no way he could finish all the cases he had been assigned for one morning. Paola Tostado, a lawyer, has represented many immigrants before judges holding hearings in the temporary court that was set up inside a detention center in Laredo, Texas, as part of President Trump’s mobilization of judges to the southwest border. For Paola Tostado, the lawyer, Ramírez was not the first client to fall through the cracks in Laredo. Even though she is based in Brownsville, three hours away, Tostado was making the pre-dawn drive up the highway as many as three times a week, to appear next to her clients in court in Laredo whenever she could. Another Salvadoran asylum-seeker she represented, whose case was similarly mislaid, had gone for four months with no hearing and no prospect of having one. Eventually he despaired. When ICE officers presented him with a document agreeing to deportation, without consulting Tostado he had signed it. In her attempts to free Ramírez, Tostado consulted with the court clerk in San Antonio, with the ICE prosecutors and officers detaining him, but no one could say how to get the case started again. Then, one day after reporters sat in the courtroom and spoke with Tostado about the case, ICE released him to pursue his case in another court, without explanation. But by December Tostado had two other asylum-seekers who had been stalled in the system for more than seven months. She finally got the court to schedule hearings for them in the last days of the year. Unlike criminal court, in immigration court people have no right to a lawyer paid by the government. But there was no reliable channel in Laredo for immigrants confined behind walls to connect with low-cost lawyers. Most lawyers worked near the regular courts in the region, at least two hours’ drive away. Sandra Berrios, another Salvadoran seeking asylum, learned the difference a lawyer could make. She found one only by the sheerest luck. After five months in detention, she was days away from deportation when she was cleaning a hallway in the center, doing a job she had taken to keep busy. A lawyer walked by. Berrios blurted a plea for help. The lawyer was from a corporate law firm, Jones Day, which happened to be offering free services. Two of its lawyers, Christopher Maynard and Adria Villar, took on her case. They learned that Berrios had been a victim of vicious domestic abuse. A Salvadoran boyfriend who had brought her to the United States in 2009 had turned on her a few years later when he wanted to date other women. Once he had punched her in the face in a Walmart parking lot, prompting bystanders to call the police. He had choked her, burned her legs with cigarettes, broken her fingers and cut her hands with knives. Berrios had scars to show the judge. She had a phone video she had made when the boyfriend was attacking her and records of calls to the Laredo police. The lawyers also learned that the boyfriend had returned to El Salvador to avoid arrest, threatening to kill Berrios if he ever saw her there. She had started a new relationship in Texas with an American citizen who wanted to marry her. But she’d been arrested by the Border Patrol at a highway checkpoint when the two of them were driving back to Laredo from an outing at a Gulf Coast beach. As sitting judges, Pettinato and others who were part of surge details could not speak to reporters about what they saw. But officials of the judges’ union, the National Association of Immigration Judges, said the problems in Laredo were not isolated. Another association official, Lawrence Burman, a judge who normally sits in Arlington, Va., volunteered for a stint in a detention center in the rural Louisiana town of Jena, 220 miles northwest of New Orleans. Four judges were sent, Burman said, but there was only enough work for two. The impact on Burman’s case docket back in Arlington was severe. Dozens of cases he was due to hear during the weeks he was away had to be rescheduled, including some that had been winding through the court and were ready for a final decision. But with the enormous backlog in Arlington, Burman had no openings on his calendar before November 2020. Immigrants who had already waited years to know whether they could stay in the country now would wait three years more. Such disruptions were reported in other courts, including some of the nation’s largest in Chicago, Miami and Los Angeles. Justice Department officials calculated that judges on border details completed 2700 more cases than they would have if they had remained in home courts. Officials acknowledge that the nationwide caseload continued to rise during last year, reaching 657,000 cases by December. But they noted that the rate of growth had slowed, to .39 percent monthly increase at the end of the year from 3.39 percent monthly when Trump took office. Judge Tabaddor, the association president, said the comparison was misleading: cases of immigrants in detention, like the ones the surge judges heard, always take priority and go faster than cases of people out on release, she said. Meanwhile, according to records obtained by the National Immigrant Justice Center, as many as 22,000 hearings in judges’ home courts had to be rescheduled in the first three months of the surge alone, compounding backlogs. It remains unclear why border detention courts were chosen for an experiment in accelerated justice. In 2017 apprehensions of illegal crossers at the southwest border “were at the lowest level in 45 years,” Tyler Houlton, a Department of Homeland Security spokesman, said this month. The steepest decline in illegal migration came early in the year, after Trump, with his blunt anti-immigrant rhetoric and pledge to build a wall, won the election. From April to December, as the judge surge gained steam, apprehensions of illegal migrants gradually but consistently rose, official figures show. 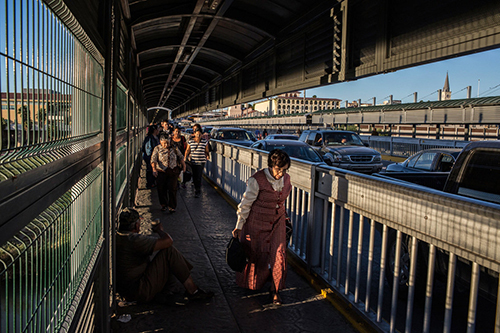 In Laredo, at the same time, just about every day migrants walk across the pedestrian bridge from Mexico and approach officers in United States customs booths, saying they have no visas but they are afraid to go back home. By describing their fears, they trigger an asylum procedure well established in American law. Many are Cubans saying they had to escape the Castro regime. But they come from many countries, as near as Central America and as far away as India and Afghanistan. Although the overall number of asylum-seekers has dropped sharply since 2016, they still come to Laredo in a steady flow, about 4,000 each month since October. Under Trump’s policies, they are detained. Many of those cases have to be decided by judges in immigration court. So there is work in Laredo for a fully-staffed court with a permanent judge. Yet in late December, the Justice Department stopped sending judges to Laredo. Cases reverted to being heard by judges in San Antonio on video conference. Justice officials did not respond to requests to explain their decision.